Fuyu persimmons and Hachiya persimmons are the most commonly available persimmons in North America. They are both from a genus called "fruit of the gods" in Greek, and they both come into season in the fall and are available into early winter. 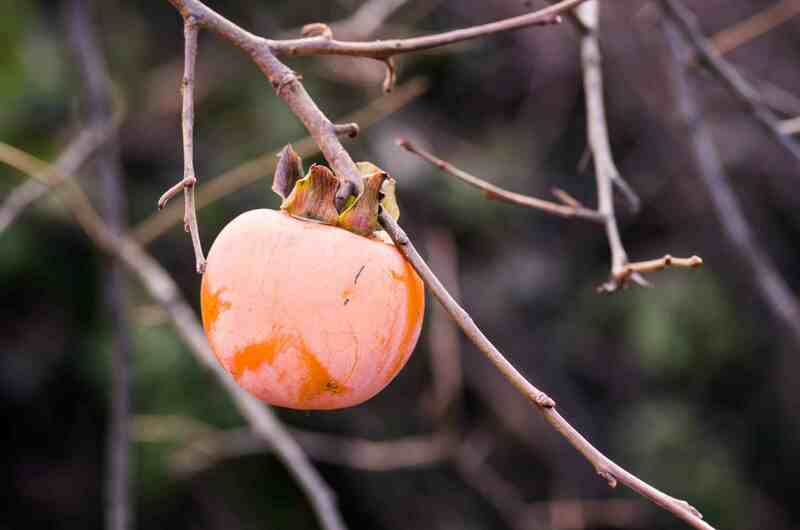 Whether Fuyu or Hachiya, look for persimmons that are bright and plump and feel heavy for their size. They should have glossy-looking skin without any cracks or bruises. Store almost-ripe and just-ripe persimmons at room temperature. Hasten ripening by storing them in a paper bag. You can keep very ripe persimmons loosely wrapped in plastic in the fridge for a few days, but ripe persimmons are best used sooner rather than later. Fuyu persimmons are distinguished by their "flat" bottoms and squat shape. Fuyus should be more orange then yellow and are at their best when just barely a bit soft. They will ripen after being picked, so buying rock-hard Fuyus and allowing them to ripen at home can be a good strategy for these fragile fruits. Fuyus are commonly eaten raw, often sliced and peeled and then added to salads. They can also be roasted to great effect. They have a mild, vaguely pumpkin-like flavor. Prepare Fuyus by hulling them (cutting out their tops and the tougher attached flesh beneath the stem), slicing, and peeling them. Remove and discard the large black seeds as you encounter them. Hachiya persimmons are elongated and oval-shaped. They are mouth-puckeringly tart unless truly, absolutely, supremely ripe. Ripe Hachiyas are unbelievably soft and are often almost liquefied into a silky smooth pulp inside the peel. Like Fuyu persimmons, they will ripen once picked, so you can let them soften on the kitchen counter until ready to use. Hachiyas are thought of as "baking" persimmons and are commonly peeled and puréed into a pulp to add to baked goods. They add stable moisture and a mild, pumpkin-like flavor to cakes, puddings, and other treats. Unlike Fuyu persimmons, they work less well raw since they need to be very ripe (and thus super soft) to be tasty. They are also used to make hoshigaki, Japanese dried persimmons where they are hung to dry. Hoshigaki are dried Hachiya persimmons that have been hung to dry and then massaged to bring their sugars to the outside, making them look frosted. They are intensely sweet and a bit chewy. Because of the intensive labor involved in making true hoshigaki and not just dried persimmons—and there is indeed a difference—they aren't widely available.